Aspley midfielder Matthew Payne took out the inaugural NEAFL MVP award, capping a stellar season, where he spearheaded the Hornets’ charge to the finals. The 28-year-old beat out Ainslie onballer Aaron Vandenberg, Redland young gun Blake Grewar, and fast-finishing NT Thunder skipper Cameron Illett, to make history in the first year the NEAFL has had a standalone Best and Fairest gong. Payne is no stranger to individual accolades, as a two-time winner of Queensland’s premier community football prize the Grogan Medal, Zane Taylor Medallist as best afield for Queensland in a representative match, and Best and Fairest winner at Southport in 2011 and Zillmere in 2007-08. Originally a Victorian, Payne began his football career in Queensland in 2005 playing for Zillmere Eagles, before shifting to the Gold Coast to play with Southport. The hard-nosed midfielder spent a season with Sturt in the SANFL in 2009, playing 14 senior games, including four finals and a losing grand final, despite being hampered by ongoing knee problems, before returning to Queensland in 2010. For the first three years of its split conference existence the NEAFL has presented separate end-of-season best and fairest awards: the Grogan Medal given to the North’s premier player, with the Mulrooney the prize gong for the Eastern Conference. But with a single 14-team competition geting underway in 2014, the Grogan and Mulrooney made way for the NEAFL MVP award. Uniquely, the award was decided by both umpires and coach’s votes, submitted post game via the match day paperwork, with votes cast on a 5-4-3-2-1 basis. Coaches met directly after a game’s conclusion and decided on the best five players on the ground, submitting a single round of 5-4-3-2-1 votes between them. 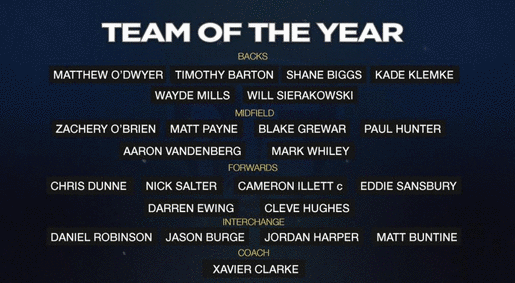 It was no surprise to see Payne also included in the NEAFL ‘Team of the Year,’ alongside the likes of Vandenberg, Grewar, and Illett, with first-year NT Thunder mentor Xavier Clarke named as the side’s coach after guiding his outfit to 15 wins this year. In other major awards presented on the night, Redland ruckman Paul Hunter was named NEAFL Rising Star, beating out a talented field of youngsters, including likely first round draft picks Isaac Heeney and Lachlan Weller, and teammate Cleve Hughes was confirmed as the competition’s leading goal kicker. Sydney University’s Kelvin Barnes and Belconnen’s Jordan Harper won Mark and Goal of the Year respectively.